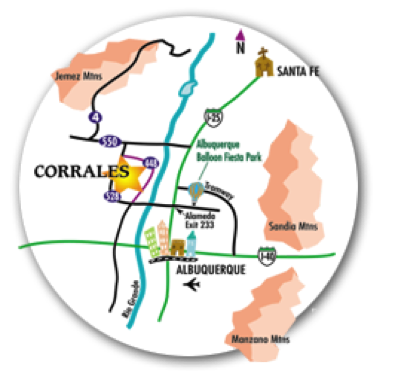 Corrales is bordered on the east by the Rio Grande river, on the north and west by Rio Rancho and on the south by Albuquerque. It is approximately 4.3 miles west of Interstate 25. Corrales Road, NM Hwy 448, is the main street through town and can be accessed at either end from NM Hwy 528.